Nosto\-\-s AI-powered personalisation solution for bag and tech accessories retail brand Knomo has been recognised as a double-winner in the eCommerce Awards for Excellence 2018. It was honoured with both the \-\-Best use of AI\-\- and \-\-Best use of Personalisation\-\- awards at the annual online retail industry event. The winning solution, which was implemented in partnership with the ecommerce team at Knomo, relies on Nosto\-\-s AI analysing visitors\-\- online behaviour to personalise the shopping experience. It does this by delivering the most relevant real-time product recommendations and pop-ups to Knomo\-\-s customers, as well as triggering personalised Facebook ads and emails. The results have been impressive. Since going live with Nosto?s personalisation technology, Knomo has achieved a 16% increase in Average Order Values from onsite product recommendations; a 60% increase in conversions from using onsite pop-ups targeting cart abandoners; and a 10x Return on Ad Spend via Facebook retargeting. 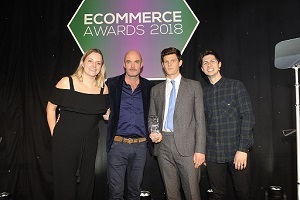 Now in their tenth year, the eCommerce Awards have consistently broken new ground in highlighting some of the very best online retailers, online companies, agencies, innovations, products and campaigns the ecommerce industry has to offer. ?Working with innovative and groundbreaking retail partners such as Knomo continues to validate that our next generation AI technology massively improves the consumer shopping journey and creates a much more relevant experience. A huge thank you obviously goes out to Knomo, who with their customer obsession really help deliver our technology in ways that consumers love! ?